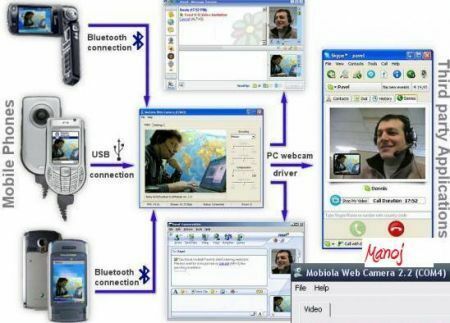 Short description: The first application that realistically turns your Symbian phone into a PC-compatible webcam and truly replaces your usb camera. Works over Bluetooth! Product description for Mobiola Web Camera 2 for S60 2nd Edition 2.2: [/b]Turn your phone into a high-quality web camera. Very simple to install and configure, Mobiola Web Camera connects over Bluetooth or usb and consists of two software components. * a webcam PC driver compatible with any Windows application that can receive video feeds from a web camera including Skype, Yahoo, MSN, aol im, icq messangers, www.YouTube.com, www.MySpace.com and www.grouper.com. Carry your webcam with you wherever you go and connect it to your laptop at anytime. Try now! System Requirement: 8 MB of free disk space on PC, 68kb of free phone memory, 720kb run time memory.